The new offer from Sports Direct would have seen the company underwrite the raising of ?200m by issuing new shares, higher than its previous proposal. 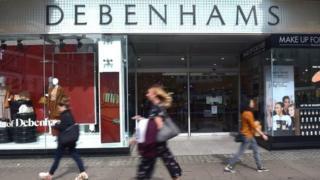 Debenhams is expected to go through a pre-pack administration, which would mean current shareholders - including Mr Ashley who owns nearly 30% of the chain - would be wiped out.While the shops would continue trading for now, Debenhams has proposed closing around 50 branches from next year and renegotiating rents with landlords to tackle its funding problems. Debenhams has been struggling for a while and issued three profit warnings last year.Towards the end of 2018, the chain announced it was increasing its store closure plans from 10 to 50 over a three to five-year period.The company said it was not ready to release a list of which shops may be affected.In February, it was revealed that the shutting of 20 of those stores could be brought forward if the department store chain took out a company voluntary arrangement (CVA).Debenhams has 165 stores and employs around 25,000 people.